Three notable smartphones have all been officially announced recently, the LG G2, Motorola Moto X and Nokia Lumia 1020. The Lumia 1020 has already released, with the Moto X and LG G2 both arriving shortly. 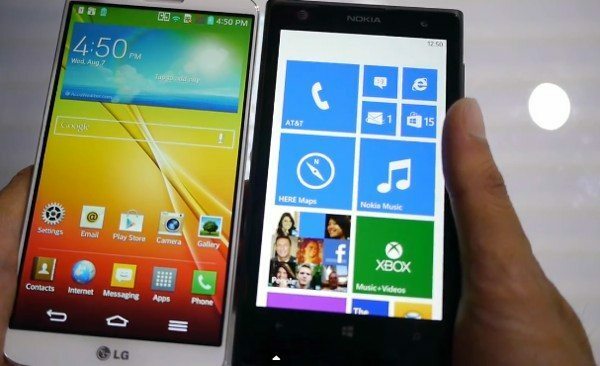 Today we want to share some videos and specs that give an initial look at the LG G2 vs. Moto X and Nokia Lumia 1020. We have two YouTube videos that you can view, that will give you some idea of what these phones have to offer. The first video is a 4-minute look at the LG G2 vs. Nokia Lumia 1020. It starts with a price point for the Lumia 1020 although the LG G2 has not been given a price yet, being the most recently announced of these three phones. The video gives a clear look at the designs of the LG G2 and Lumia 1020 and points out that the build of the Lumia device makes it pretty heavy. It continues by detailing the displays and then the cameras of the two devices, and then some of the differences in specs between the two. It also discusses the fact that the LG G2 runs Android while the Lumia 1020 is a Windows Phone handset. The video packs a lot of information into a short time and is a useful introduction to these two smartphones. 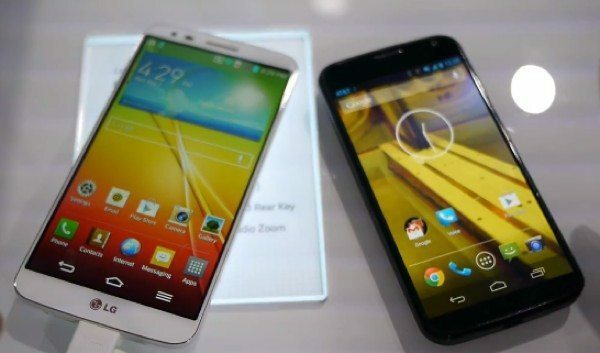 The second video below is a 5-minute comparison of the LG G2 vs. Moto X. It begins with a look at the designs of the two Android phones and shows how the LG G2 has beautifully slim bezels. It then discusses the displays, cameras, and notes that both handsets offer a very snappy performance thanks to their respective processors. As with the first video, this offers an interesting initial look at these devices. To round things off we’ll give you a quick rundown of the key specs of each of these phones, as they are all quite different. Bear in mind though that all have many features that we cannot detail here but this should at least give an idea of how they compare specs-wise. The just-announced LG G2 is powered by a 2.26GHZ Qualcomm Snapdragon 800 quad-core processor, 5.2-inch True HD-IPS + LCD display with resolution of 1920 x 1080 and 424 ppi, 2GB of RAM, and 32GB of non-expandable internal storage (24GB user available). It also has a 13-megapixel rear camera with 1080p video capture @60fps, a 2.1-megapixel front-facing camera, LTE, and a 3000 mAh battery. The G2 runs the Android 4.2.2 Jelly Bean operating system. The Motorola Moto X has a 1.7GHz Qualcomm Snapdragon Pro dual-core processor, a 4.7-inch AMOLED display with resolution of 1280 x 720 and 312 ppi, 2GB of RAM and 16 or 32GB of internal storage (non-expandable). It totes a 10-megapixel rear camera with 1080p video capture @30fps, a 2-megapixel front-facing shooter, LTE, and a 2200 mAh battery. Like the LG G2, this also runs Android 4.2.2 Jelly Bean. The Nokia Lumia 1020 is powered by a 1.5GHz Qualcomm Snapdragon dual-core processor, has a 4.5-inch AMOLED display with resolution of 1280 x 768 and 332 ppi, 2GB of RAM, and 32GB of internal storage (non-expandable). It carries a 41-megapixel rear camera with PureView technology and 1080p video capture @30fps, 1.2-megapixel front-facing camera, LTE, and a 2000 mAh battery. The Lumia 1020 runs Windows Phone 8, upgradable to WP8 Amber. Hopefully, these specs and the videos that you can see below this story will give you a good idea of what each of these three smartphones have to offer. If you are considering purchasing a new smartphone is it likely to be one of these three new devices? If so, will you opt for the LG G2, the Moto X or the Nokia Lumia 1020? The Nokia lumia1020 is a league of its own. Any comparison with other phones is not important. There’s no phone that can match the camera of the lumia1020.